Personalized silicone made bracelets from AmazingWristbands.com help you raise awareness for Cord Blood. When a baby is born, the blood inside the umbilical cord contains some adult stem cells that have proven to develop into healthy blood cells. Ongoing studies are working to determine if that cord blood can be used to treat various diseases if it’s donated to an unrelated person. National Cord Blood Awareness Month was created to raise awareness of the importance of cord blood and to encourage people to participate in clinical trials. Founded by the National Heart, Lung and Blood Institute, the message National Cord Blood Awareness Month has already reached thousands of people. Why Buy National Cord Blood Awareness Month Wristbands from Amazing Wristbands? Amazing Wristbands is a leading provider of customized silicone wristbands available online, including National Cord Blood Awareness Month bracelets. Our wristbands are comfortable, durable, and non-allergenic, made of 100% silicone. Many of our wristbands can be created with our easy-to-use online tool. In addition to standard wristbands, we also offers super popular slap bands that “snap” to a person’s wrist, as well as half-inch bands, thicker one-inch bands, adjustable bands, USB bands, silicone rings and silicone key chains. 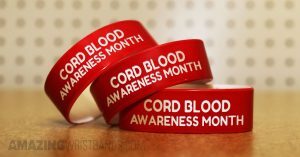 Design your own National Cord Blood Awareness Month bracelets online now at AmazingWristbands.com !